I know it’s officially spring, but I made you soup! Yes, it’s spring, but there’s still a chill in the air. Just yesterday it snowed here in Baltimore, so there’s still time for this Roasted Red Pepper Smoked Gouda Soup. I’m sure you’d rather be eating this Mediterranean Chicken & Grilled Veggie Salad, but you’re getting soup instead, so deal with it (wink). We’ll be up to our eyeballs in garden soil before you know it, reaping the fresh produce we so carefully sowed and prayed to the high heavens to grow. Until then, I’ve roasted a few hot house red peppers and turned them into a velvety smooth soup made with creamy smoked gouda cheese. I’ve always had a thing for roasted red pepper soup, but never did I think to add cheese. It’s the end all be all, you guys. Cheese is king! Aside from roasting and removing the charred skin from the peppers, this soup is fairly simple to make. It’s the kind of soup you pair with a fat hunk of crusty bread or a crunchy, gooey grilled cheese sandwich. 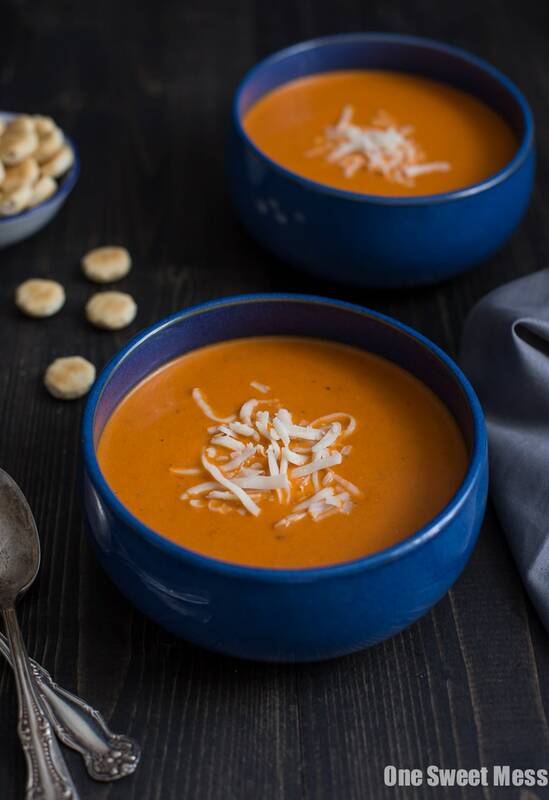 If you’re looking to add light soup to your Easter menu, this Roasted Red Pepper Smoked Gouda Soup is the perfect way to start a family meal. This soup is intensely flavorful with a hint of smoke in the background. It’s best served piping hot with a fat hunk of crusty bread. Preheat oven to 425 degrees F. Place the peppers on a baking pan and drizzle with 2 tablespoons of olive oil, turning the peppers to coat evenly. Roast for 15 minutes. Flip each pepper and roast for an additional 15 minutes. The peppers should be soft and slightly charred. Remove the peppers from the oven and cover the pan with aluminum foil. Allow the peppers to steam for 10-15 minutes. Uncover and allow the peppers to cool long enough to handle. When the peppers are cool enough to handle, remove the stem, seeds, and charred skin. Tear the peppers into 2-inch strips and set aside. Heat remaining 1 tablespoon of olive oil in a large pot over medium heat. Add the carrots, celery, and onions to the pot. Cook for 7-10 minutes, or until the veggies have softened. Add the garlic and bay leaf to the pot and cook for an additional 2 minutes, stirring often so the garlic doesn’t burn. Add the cumin and smoked paprika; stir to combine. Pour the stock over the veggies and add the roasted red peppers to the pot. Bring the mixture to a boil; turn down the heat and allow the soup to simmer for 20 minutes, or until the carrots and celery are tender. Remove the pot from the heat and pluck out the bay leaf. Using an immersion blender, blend the soup until smooth. Alternatively, you can ladle the mixture into the bowl of a blender or food processor and pulse until smooth. Place the pot back over the heat and stir in the heavy cream and sugar. Slowly stir in the grated smoked gouda. Season with salt and pepper to taste. Serve with a side of crusty bread. Smoked gouda is a favorite of mine! I bet it is fantastic in this soup! Hope you had a great weekend! Smoked Gouda and Roasted Red Pepper is a match made in heaven. Looks amazing! We’re in a winter storm watch until Thursday, so this soup is just what we need! This sounds divine! Can’t wait to try it! I absolutely adore smoked gouda in anything. My all-time fav cheese!!! What a great combo! I’m always trying to sneak smoked gouda into the grocery cart – now at least I’ll have an excuse! I would still eat this, no matter how warm and springy it got. red peppers always taste so fresh and delicious, i doubt it would matter. This would be delightful with a side salad or wee spring sandwich. Hi Steph! Thanks for stopping by. Sorry about the confusion. I added the heavy cream to the instructions but failed to add it to the ingredient list. I’ve made the necessary edits to the recipe. Thank you so much for bringing the elusive heavy cream to my attention. Happy cooking! Hi, I made your soup yesterday. It tasted pretty good. I am by no means a chef so I had to do some minor tweaking. I don’t own a food processor and my blender is 20 years old, so it wasn’t as smooth as I anticipated, Also I don’t know the difference between heavy cream of half and half, so I used half and half. Oh yea, I used a dash of tabasco, cause I like a little more kick, but otherwise, EXCELLANT easy recipe. thank you so much. I would love to make this in my vitamix, any suggestions? Help! My Gouda just melted into blobs in the pot! The soup without the cheese was excellent, and I would make it again. Oh no! I’m so sorry to hear the cheese didn’t melt properly. Did you remove the pot from the heat before adding the cheese? Sometimes the heat from the burner can cause the cheese to seize. Freshly grated cheese works the best for melting. Pre-shredded cheese is mixed with an additive that prevents clumping, which often prevents the cheese from melting properly. Tried the soup last night. It was very good. Thanks for the recipe. I’ll check out some of your other creations. Hi Betsy! Thank you for taking the time to leave a review. I’m so happy to hear you enjoyed the soup. I sincerly never had a soup that good. I am speechless. It took so long and peeling off the skin of the peppers was a pain in the a** but I will have to tell my mother I tasted a soup better than hers. Again, speechless!! !